Wheeling WV …Wheeling Island Hotel, Casino & Racetrack. Your package here will be $50 SD. Plus you will get a buffet breakfast. There’s no better place for non-stop gaming action than Wheeling Island Hotel-Casino-Racetrack in West Virginia. Equipped with the best in slots, table games, world-class hotel accommodations and live entertainment, Wheeling Island helps you get away and beat the odds. 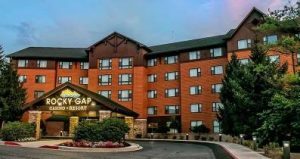 Flintstone MD…Rocky Gap Casino Resort…You will get $30 in SD here. The casino floor at Rocky Gap Casino Resort is alive with over 600 slot machines ready for your next bet! Plunge into the action at any of our interactive slot machines and feel the thrill with every pull. From penny slots to $25 games, we have a little of everything to satisfy your taste for excitement. If you crave table games, then let Rocky Gap Casino Resort deal you a winning hand. Step right up and try your luck on blackjack, roulette, Mississippi Stud and Three Card Poker. Our friendly staff is ready to deal you in whether you’re a beginner or an experienced player.